I love to bake. And I also happen to be engaged to an Irishman (yay!) with a massive sweet tooth. Most weekends there will be ‘domestic goddess’ smells wafting from my kitchen at some stage. But I’m always on the lookout for ideas to make my baking as healthy as possible, without sacrificing deliciousness. So when I first came across Kelley Herrings fab eBook ‘Guilt-Free Desserts‘, I was intrigued but more than a little skeptical. Could dessert really be healthier AND still live up to my taste expectations? The good news from my recent baking adventures is that it can! So today I wanted to share some tips for guilt-free baking and introduce you to my latest favourite source of healthy baking recipes. Enjoy! One of my first jobs as a young food scientist was working in the chemistry lab of a large margarine factory. Still the worst smelling work place I have ever encountered. Needless to say I haven’t voluntarily eaten fake butter since. Real butter comes from real cows fed on the food they are naturally designed to eat, real grass. Not only does it taste better, it’s better for us with higher levels of omega-3 fats and vitamin E than butter from grain-fed cows. 2. Explore healthy wheat flour alternatives. Even if you don’t have a problem with gluten, wheat flours are best avoided. They tend to have a high glycemic index (GI), meaning they cause spikes in blood sugar and promote weight gain. Be careful with ‘gluten-free’ flour mixes as they are often based on a blend of other high GI flours like rice. So even though the gluten is gone, they still cause the same problems with your blood sugar. Almond meal or almond flour has been my go-to option for healthier baking for a while now. It’s gluten free and low GI. It tastes delicious and keeps baked goods moist. The only downside is that compared to regular flour, it’s on the expensive side. Coconut flour is another gluten-free, low GI alternative that is also high in fiber. It’s more of a new comer to my baking arsenal but I’ve been really happy with my experiments so far. The thing to remember with coconut flour is that a little goes a long way. So even though it is way more expensive than regular flour, you’ll find you’re using far less. So the actual cost in use isn’t as bad as you’d initially think. 3. Choose a good quality natural sweetener. I probably don’t need to tell you how sugar impacts our blood sugar levels and the resulting health problems. The good news is there are now sweetening alternatives that are low GI and natural. The best I’ve found so far is a combination of Erythritol and Stevia. The brand I’ve been using is called Natvia and for Australian readers it’s available in Woolies. I’m sure there are many good alternatives out there, just look on the ingredients list for a sweetener containing Erythritol and Stevia. Erythritol is a ‘sugar alcohol’ which acts like sugar in baking without the calories or impact on our blood sugar. It’s a naturally occurring compound found in fruit. And has about 70% of the sweetness of regular sugar. It’s available to buy on its own or pre-blended with Stevia. Be wary of agave syrup or nectar. Although it’s a natural product made from cactus, it actually contains high levels of fructose. This means it is like a more natural form of high fructose corn syrup – not the healthy alternative sweetener it initially appears to be. looking for more guilt-free baking tips and recipes? I’ve been having heaps of fun baking my way through the ‘Guilt-Free Desserts. The photography could be much better, so if you’re looking for page-licking images, you won’t find them here. The other thing I don’t love is that the measurements are in cups and spoons. Which is slow and inaccurate. But apart from that it’s a wonderful resource for guilt-free baking. BUT! If you’re keen for some great healthy recipes for sweet treats, then you’re in luck. Adapted from Guilt-Free Desserts by Kelley Herring. If you’re wondering what the whole paleo / primal eating thing is about, you might enjoy this post I wrote about my introduction to paleo eating. With all those eggs it can be easy to over bake these brownies so make sure you set your timer! It’s better to err on the side of slightly under baked. 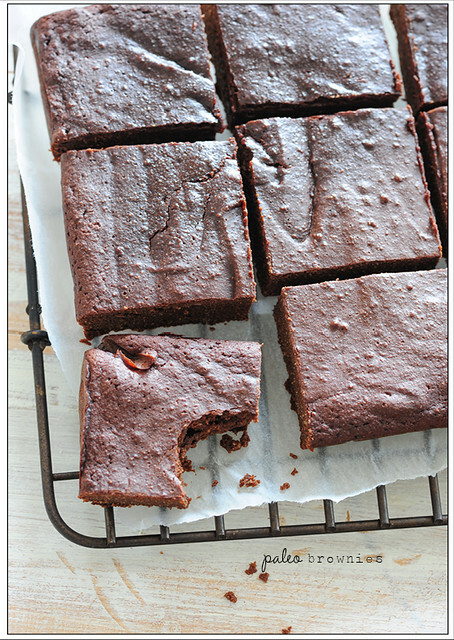 While they’re lovely freshly baked, this is one of those brownie recipes that improves with age. I like to (try to) leave them for 24 hours for that heavenly squidgy brownie texture. I think they’re much better when they’ve had a bit of time so the moisture from the less cooked middle redistributes out to the edges. 1. Preheat your oven to 180C (350F). Line a 20cm (8in) square tin with baking paper. 2. Melt butter or coconut oil. Remove form the heat. Add chocolate and stand for a few minutes. 3. Stir and when the chocolate has melted add the stevia and eggs, stirring well. Then add the coconut flour and stir until well mixed. 4. Pour into the prepared pan and bake for 15-20 minutes or until just cooked around the edges but still a little moist in the middle. 5. Remove from the tin and cool on a cake rack. egg-free / vegan – I’m afraid the eggs are really critical here. Best to find another recipe I’m afraid. no stevia? – If you’d prefer to use regular sugar that’s fine. Just increase it to 150g (5 1/4oz). regular flour – I haven’t fully experimented replacing coconut flour with regular plan or all-purpose flour. But I’d guess if you replace the coconut flour with double the amount of regular flour you’d be in the right ball park. almond meal – again, I haven’t tried this but if I didn’t have coconut flour I’d use about 200g (7oz) almond meal. vanilla – not essential but 2 teaspoons of vanilla extract added with the eggs can be lovely. ps. 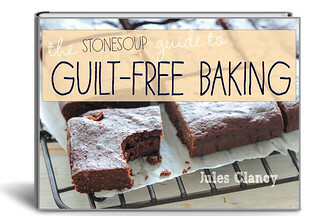 The links to ‘Guilt-Free Desserts‘ are affiliate links so if you do decide to purchase, I get a commission so you’ll be supporting Stonesoup too! What a great post. I have a sweet tooth and so I am always really grateful for more healthy options. So many thanks for this inspiration and for the measurement conversion! I had a question regarding the stevia/erythritol blend. I cannot find this here in the UK but seen that they sell the two seperatly online. What would be the ratio to mix them together? In Guilt-Free desserts the recipes are written with the erythritol added separately from the stevia. Generally you only need a small amount of stevia to boost the sweetness. Although I’d first try just using erythritol on its own and then adding a few drops of stevia (if liquid) to increase the sweetness to suit your taste. Can’t wait to test out your brownies! Never heard of your sugar substitute but want to give this a go as i’m not a huge fan of the artificial sweetner style sugars and you know how much of a sweet tooth I have! Keep up the blog.. I love it! The stevia / etrythritol blend bakes pretty much exactly like real sugar in terms of browning etc (not sure how it would impact ‘spread’ on cookies though :) And the flavour is pretty similar.. no bitterness or weird aftertastes. But like so many recipes or products that cut down on sugar, it’s high in fat! It’s actually not any higher in fat than regular brownies.. and it’s super high in protein from all of the eggs. Congratulations on the engagement! Also I wanted to let you know that I love your website – I have been a member of the cookery school for over 12 months and find it great. Trying to be more conscious of what I eat so am going to buy the Guilt Free Desserts. thanks. Thanks so much for the congrats AND for supporting Stonesoup.. I really appreciate it. 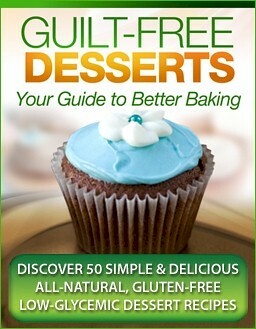 Am sure you’ll love the guilt-free desserts ebook! Congratulations!! So excited for you. And it’s a perfect excuse to bake some brownies in your honor on the weekend. Was wondering if many people would notice the news dropped in casually. Hi Erin, did you use 250g almond meal as Jules’ note suggests or just 50g instead of the coconut flour? Sorry, that should be 200g or 50g almond meal? Thanks! This may be a very silly question, but I’m not that exprerienced in the kitchen as most! I’m interested in getting the Guilt Free Desserts, but wondered if I’d have to convert quantities from US measurements to Aus for each recipe? Not for each recipe.. I just give a table so you can easily convert as you go. I do enjoy your recipes, but as a fellow food scientist I’m surprised you described agave the way you did. I suppose saying HFCS works because agave is liquid and through an enzyme process like HFCS. In a way though it is worse since it is all fructose. Really, all caloric sweeteners are the same in they are bad for your body with honey as a small exception. Perhaps it is my American ism since HFCS has a bad rep in the US. Lovely to hear from a fellow food scientist.. I was just trying to keep it simple.. Thanks for the fuller explanation… interested to see what you think of maple syrup? thank you so much for all of those tips. i learned a lot. Watched your cooking videos recently and couldn’t help but notice the substantial rock on your engagement finger! It felt rude to comment without an announcement on your part, so much happiness to you and your Irishman. In my house dinner is definitely not complete without dessert, so many thanks for your delicious (and easy) dessert recipes. These are super delicious, but my family all agrees they aren’t too much like “real” brownies. No doubt – we love them though! They’re super delicious, but I may tweak the recipe a bit to try and get the texture a little more brownie like. I’ll let you know of the results! I just made these, but could only use 4 eggs (because I’m a duffer) – glad to report they are still delicious, and have a nice texture, even while still warm! (couldn’t resist). I think they are quite brownie-like. Might add some chopped macadamias next time. Great to know they’re still good with less eggs Sarah! Looking forward to trying these brownies out too, yum yum yum. Made these brownies to spec. When I took them out of the oven one corner was not cooked, had a big crease in the baking paper. I turn the oven off and let the brownies sit. The did firm up, but after a day they seemed a wee bit dry. They have an interesting texture that went well with a scoop of mint chocolate chip ice cream which kinda adds the guilt back in. On there own, I find they have an after taste from the stevia / erythritol blend. Kind of expensive, I figured it cost $10.09. Cons: hate the smell of the stevia/erythritol, it’s so fine the dust get right into lungs. I might have a go with real sugar. Big congrats on your engagement! All the very best. Thanks for the review Kathleen! And really appreciate your best wishes. Thanks! An important sidebar, Mushrooms must be grown with natural sunlight to have all of their valuable properties. Why say this, because now a lot of mushrooms are grown in greenhouses. I read an article about this. These are delicious. I’m paleo and sometimes you would just die for a cakey treat. I see myself baking these every weekend! So glad you enjoyed them Sal! Please convey my congratulations to your Irishman on winning such a lovely bride-to-be! I wish you both a long and happy life together. In the fullness of time I trust you will be posting recipes for a wedding breakfast and wedding pictures. Please convey my congratulations to your Irishman for winning such a lovely bride-to-be. I hope you have a long and happy life to gether. Looking forward to seen your posts of wedding breakfast recipes and wedding photos. Oh my frustrating computer. I waited so long to see the first post go up. So I went to do something else for awhile. I didn’t check to see if it had finally gotten there before I rewrote it and posted it again. I’m sure you don’t mind a double dose of congratulations and best wishes. Just a curiousity – have you tried Xylitol? It’s a great sugar alternative – it has a really low GI (7) and is actually good for your teeth – Dentists have recommended Xylitol gum to me for my children after they eat. Oh, I should mention – you can use Xylitol as a substitute for sugar in nearly every recipe, however it will not caramalise (sp?). Although it is recommended as a 1:1 substitution, I found I could get away with using less Xylitol. Apparently it is readily available overseas, however in Australia I have only been able to find it in health food stores, it is a touch expensive though. *Start slow – when first starting on Xylitol, if you eat too much, it can cause flatulance and have a mild laxative effect. *DO NOT FEED TO DOGS! as it is toxic to dogs. Xylitol is a low kilojoule sugar substitute that is gaining a reputation for its health-boosting properties, namely the effect it has on preventing tooth decay. While its name may sound artificial, xylitol is found naturally in fibrous fruits and vegies such as plums and corn and is also produced in the body. With 40% less kilojoules than sugar, negligible carbohydrate content and a low GI of 7, xylitol is a good option for those with diabetes. As xylitol is metabolised slowly by the body, it doesn’t cause the ‘sugar spike’ that may be experienced with other sugar products, leading to a subsequent drop in blood sugar and a craving for more sweetness. Unlike artificial sweeteners, xylitol has no bitter aftertaste and may actually promote oral and aural health. While sugar promotes the growth of bacteria, xylitol prevents their growth. In particular, xylitol has been found to inhibit streptococcus mutans, the main bacteria responsible for causing dental cavities. So in addition to not causing tooth caries like sugar does, xylitol is able to actively repair minor dental damage. In a 2004 study, researchers also found that xylitol damages Streptococcus pneumoniae, one of the main causes of ear infections. By harming the bacteria, it is thought that xylitol may destabilise the bacteria and prevent it from multiplying. In large doses, xylitol can have a mild laxative effect. There is no known toxicity, with humans ingesting up to 400 grams a day for extended periods with no apparent problems. It does, however, cause hypoglycaemia in dogs, which can result in depression, seizures and reported death. Xylitol is not as widely available as its artificial counterparts, partly due to the fact it’s more expensive. It is more popular overseas, with virtually all chewing gum sold in Europe sweetened with xylitol, and China, Japan and North Korea following suit. In Australia, we can find it in some chewing gums sold in health food stores, and confectionery such as chocolate, baking mixes and as a simple crystallised form with a similar consistency to sugar. It is also added to some toothpastes and dental gels. Anyway, I forgot to mention the best part about Xylitol when compared to other sugar subsitutes – NO BITTER AFTERTASTE! Thanks for the link Jenna! Oh wow! These are nice! I only used 100g of chocolate as I didn’t want it to be too rich and for some reason I needed to cook it for longer, so my brownies turned out more like cake/slice, but I’m very happy with the result. I get a slight aftertaste feeling from the Nativa I used, but it’s only a feeling and not a taste and it is only slight, so it doesn’t take away from the enjoyment. I can see these are going to be on my regulars list. I made these brownies today and they are fabulous. Thanks for sharing the recipe. They took much longer to cook, not sure why, but they’re great. Did you put salt in the video version? I thought I remembered seeing you do that in the vid but it wasn’t in the instructions; regardless they came out well. If they took longer to cook it’s probably either your oven wasn’t as hot as mine (and they do vary a lot so this is the most likely cause). The other could be the size and shape of your pan. Does coconut flour have a distinct coconut taste to it? Does that affect how the final product tastes? Hi! Great recipe; thanks for sharing! I made these today but used 150ml of coconut palm sugar instead of stevia. They were delicious! THESE ARE FANTASTIC!!! I made them for New Years so I could indulge a little, and you are right they are better as the days go on. Thanks for this recipe, you have saved my relationship with brownies! Mine also cooked longer, maybe 35 minutes or more, but I just kept checking them. I used xylitol, maybe it has an effect. I don’t have chocolate but I have amazing cocoa powder. How would you substitute that? Also, if I wanted to use brown sugar or honey, in what amount would you substitute it? Sorry, I saw you do have a sugar substitute. What about honey and cocoa powder though? 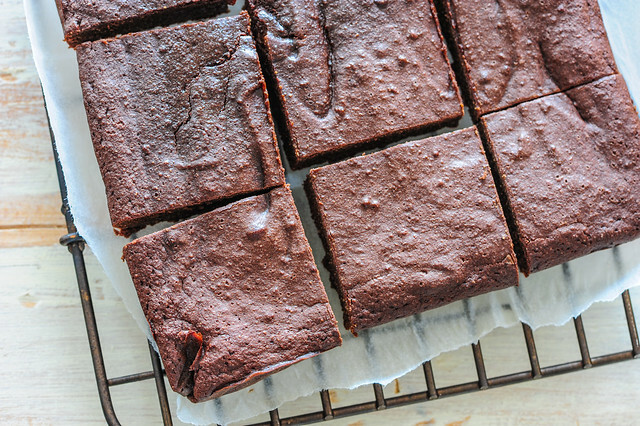 I’ve had a lot of coconut flour brownies, but these are the BEST EVER! Thank you for stating the truth about agave nectar. I can’t believe how many people include agave in their ‘healthy’ recipes. If I like the recipe otherwise, I’ll just substitute something I like for the agave. I’m not real familiar with the paleo diet, just know some of the basic principles, but somehow it seems to me that brownies don’t really belong in true paleo eating? I guess it’s just difficult for most people to live without baked stuff? The recipe looks good, though. And you’re right this probably isn’t strictly ‘paleo’… don’t think they had access to ‘erythritol’ back then… but it’s close. Jules, you may not be aware that your affiliate link to “Guilt Free Desserts” is not functioning! I’ll hold off a day or so, or until I receive your response before I attempt it again. I know I can purchase it through her website, but would prefer to let her know I discovered her through you! Happy New Year you and your family. Hi Jules my body doesn’t handle Stevie/natvia too well. Do you think I’d be successful subbing in a small amount of honey or maple syrup? Also do these freeze/defrost well? Your recipe ingredients sound simple. Except for the sweetener. I’m on a ibs diet and on that diet, sugar substitute ending with tol are not permitted. They produce painful gas. Sugar is also not permitted. Maple syrup and Simple syrup are the only sweeteners permitted. Can they be substituted and how much? I’m surprised that maple syrup is OK Lina… but feel free to try it. Just add to taste. I’d start with 4-5 tablespoons – let me know how you get on! You might want to experiment with pure stevia powder (or growing your own stevia leaves) these don’t contain any sugars or sugar alcohols so should be fine for IBS.